You might say we crave attention. But then, that’s what we traffic control flaggers do – get the attention of pedestrians, motorists, and crews. It’s how we keep them safe in and around construction zones. I don’t like to brag, but I’d say we’re one of the main reasons that Roadway Construction Services (RCS) enjoys its admirable traffic control safety record. Traffic control flaggers in Southern California definitely don’t have it easy. Oh sure, waving a bright flag looks simple to the ordinary bystander. But there’s much more to it than that. Remember, there’s a big load on our shoulders – protecting crews, pedestrians, bicyclists, and motorists. And we’re on our feet the whole time. Blazing heat or freezing cold, we’re doing our job. The moment RCS traffic control flaggers arrive on the job, we jump into action. Our first task is overseeing the project setup, making sure every piece is in place. This includes arranging traffic control signs and traffic cones. As the job gets underway, we might assist with maintenance to ensure equipment is organized and functioning properly. We might be called upon for other tasks, too. Traffic control flaggers must be expert communicators, signs being one of our primary modes of communication. We use a variety of them during the course of any job. You’ve probably seen us flash those ‘slow down’ or ‘stop’ signs while you drive past a work zone. Those are the main ones. But there’s more. Then, of course, there are the bright flags we use to signal motorists and crew members. If you think flag-holding is simply keeping it in the right position, guess again. To do the job right, we must keep track of countless variables – road conditions, traffic flow, weather, etc. Supreme concentration is a must. Once a project is completed, we don’t break for coffee. We set down our signs and help with disassembly. Then we break for coffee. Because we face major responsibilities every second we’re on the job, RCS traffic control flaggers undergo the industry’s most rigorous training regimen. As part of the process, we acquire all skills necessary to meet the company’s very strict guidelines. We also have to meet a set of very demanding state requirements. How Many Traffic Control Flaggers Does it Take? One is enough for smaller projects. The big jobs, however, require flaggers posted on either side of the work area. Once deployed, we use two-way radios and hand signals to communicate with other crew members. This keeps them updated about traffic and road conditions at all times. So you can see that flaggers definitely boost the safety factor of RCS traffic control services. If you’re interested in learning more about their California traffic control flagging services, call RCS today at (855) 907-7233. 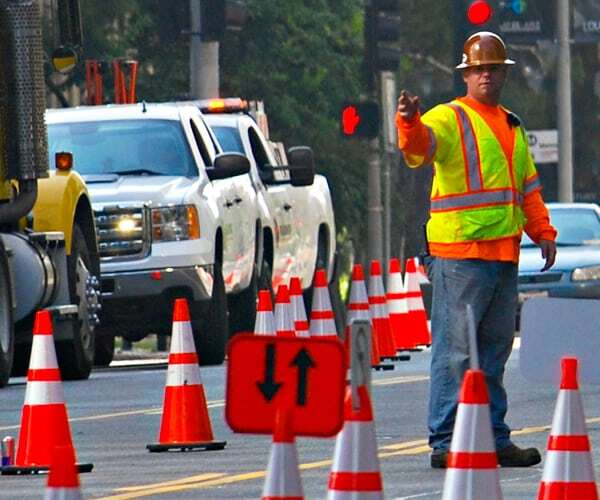 You’ll soon discover why they’re the go-to traffic control service in Los Angeles and all of Southern California.